(CNN) -- Madonna took her effort to adopt a 3-year-old girl before Malawi's highest court Monday, as a man claiming to be the girl's father said he was fighting for custody of the child. 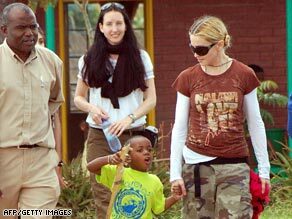 Madonna walks with her Malawian son, David Banda, in Lilongwe, Malawi, in March. The 50-year-old singer had filed a petition to adopt Chifundo James, whose first name means "mercy" in Chichewa, the country's national language. Her adoption was denied last month because Madonna did not meet a residency law that requires applicants to have lived in the country for some time before adoption. She has three other children, including a son, David Banda, whom she adopted from the southern African nation in 2006. Madonna's appeal to the Malawi Supreme Court in Blantyre, the commercial capital, started as a man claimed paternity of Chifundo, who has lived in an orphanage most of her life. The girl's teenage mother died shortly after childbirth. The Malawian attorney general's office told CNN that it considers Chifundo's grandmother and uncle, who support the adoption, as her legal guardians. James Kambewa, the man claiming to be the father, has only been heard of in the media, an official said. "He will have to undergo paternity tests in order for us to determine whether or not he is indeed the father," said Zione Ntaba, a spokeswoman for Malawi's attorney general. "But as far as today's proceedings go, Madonna's lawyers are the only party making submissions." Liz Rosenberg, a representative for Madonna, said they do not know that he is the child's biological father. "What I know is that she was not visited for the three years she was in the orphanage by anyone claiming to be a parent," Rosenberg said. "And I know that he wasn't at court or represented regarding the appeal for the adoption." "It is in the hands of the court, and I hope that they will rule based on what is in the best interests of this child," she said. Two outside groups -- the Malawi Human Rights Commission and the child rights group Eye of the Child -- are filing submissions in the case, according to the attorney general's office. The Malawi Human Rights Commission had expressed surprise at the initial ruling preventing Madonna from adopting Chifundo. Eye of the Child, on the other hand, has previously expressed the view that Madonna should be investing in projects aimed at improving the lives of needy children in Malawi instead of adopting. It is currently unclear what the two parties will argue in court. Malawian law stipulates that a prospective adoptive parent should live in the country for at least 18 months before he or she can be granted permission to adopt a child. This condition was waived when Madonna adopted David Banda. The judge in that case said the interest of the child outweighed the issue of residency. Madonna was recently divorced from British filmmaker Guy Ritchie. She has been involved with Malawi for several years and made a documentary, "I Am Because We Are," to highlight poverty as well as AIDS and other diseases devastating children in that country. She also co-founded a nonprofit group, Raising Malawi, which provides programs to help the needy. It is not clear how long the appeal will take.